A magician with talking puppets, Tommy Tiger & Ronnie Rabbit, Gerry is suitable for all children's events . Bringing fun and laughter to all ages Gerry is an experienced entertainer and balloon modeller. Children love participating whether in the show or the whole party package with music games and merriment. 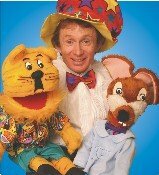 Schools especially enjoy his unique "Maths Magic " presentations showing children you can have fun with maths and learn too.Nurseries frequently book his Terddy Bears picnic Show.